This scene, looking across the Charles River from Boston to Cambridge, looks much different today. For one thing, this area is COVERED IN SNOW today. But beyond that, of course, the Longfellow Bridge and this area of Massachusetts have undergone significant transformations in the past century. At the time of this postcard — with its handwritten date of July 9, 1908 — it was simply known as the (new) Cambridge Bridge. The idea for it was proposed in 1898, it was designed by architect Edmund March Wheelwright1, construction began in 1900, and it opened to the public on August 3, 1906. 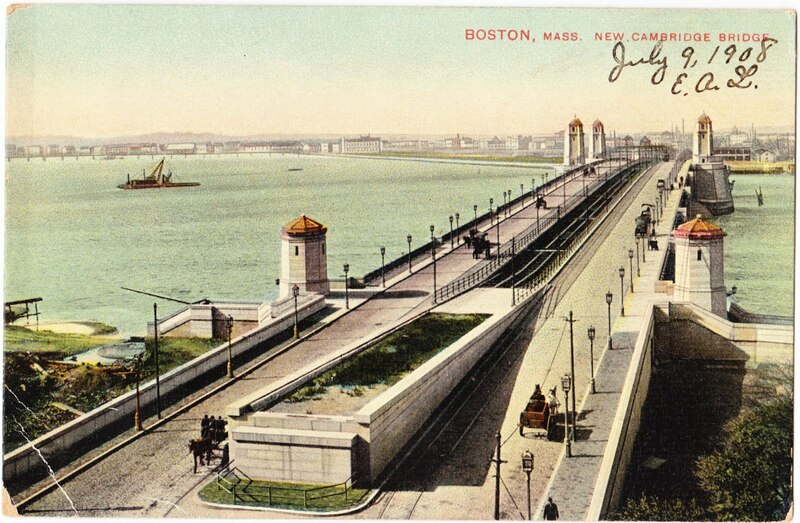 It was not renamed the Longfellow Bridge, in honor of Henry Wadsworth Longfellow, until 1927. "Note how the MIT campus does not yet exist in the background of this view from Boston to Cambridge, with the Harvard Bridge in the distance. This dates the image to before 1916. Also, note that the Cambridge Subway (Red Line) tracks on the bridge have yet to be connected to anything. This dates the image to before 1912." So 1908 seems to be spot on. 1. According to Wikipedia, Wheelwright and engineer William Jackson "traveled to Europe, where they made a thorough inspection of notable bridges in France, Germany, Austria and Russia. Upon their return, they prepared studies of various types of bridges, including bridges of stone and steel arch spans. ... Wheelwright was inspired by the 1893 Columbian Exposition and was attempting to emulate the great bridges of Europe. Its four large piers are ornamented with the prows of Viking ships, carved in granite, which refer to a hypothetical voyage by Leif Eriksson up the Charles River circa 1000 AD, as promoted by Harvard professor Eben Horsford." 2. According to the Metropolitan Postcard Club of New York City, Mason Bros. & Co. was in business from 1907 to 1917. "The hues of their three color pallet often remained distinct," Metropolitan writes. 3. Tiny Adamstown, which is only about an hour east of our house, promotes itself as the "antiques capital of the United States." Of course, we also have New Oxford to our west, and that borough promotes itself as the antiques capital of southcentral Pennsylvania.